You know how sometimes you meet someone and think that they’re kind of odd looking or just not all that good-looking (who am I to talk?! ), but then as you spend more and more time with them and REALLY get to know them, they slowly become much more attractive? Yeah? Well that’s this pen. At first glance (and second and third) it is an odd one. No way around that. 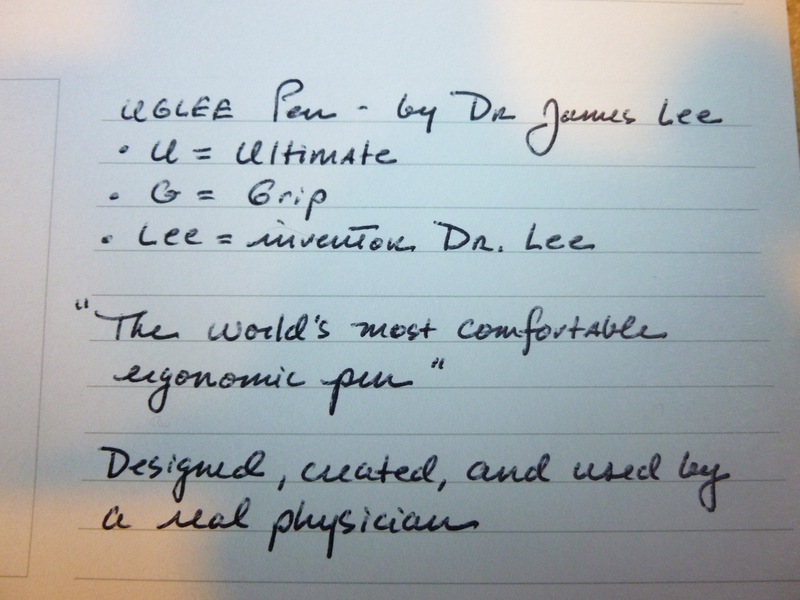 I don’t have writing pains (well, not physical ones, anyway), but once I heard about it, I knew I had to test drive Dr. Lee’s creation. 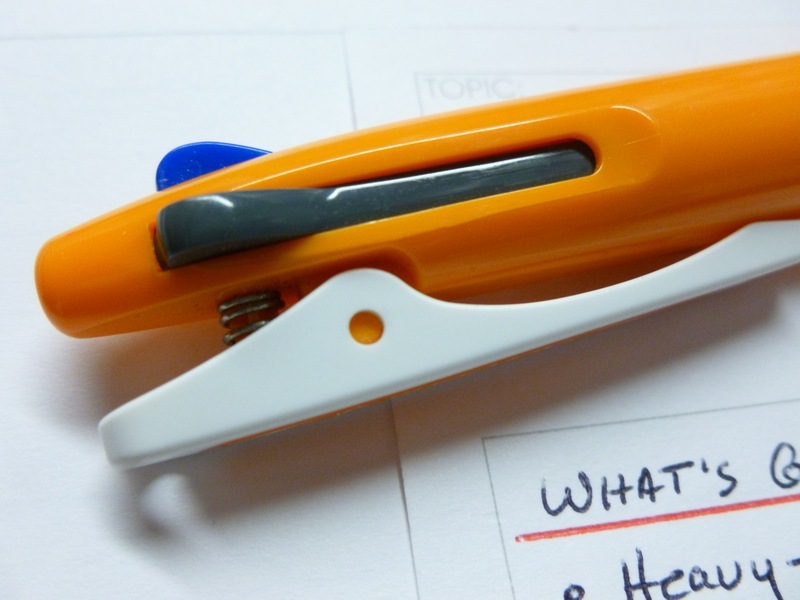 His website is full of details and videos about the design and benefits of the pen as well as testimonials from doctors, nurses, and students, and just plain people…basically anyone who writes. 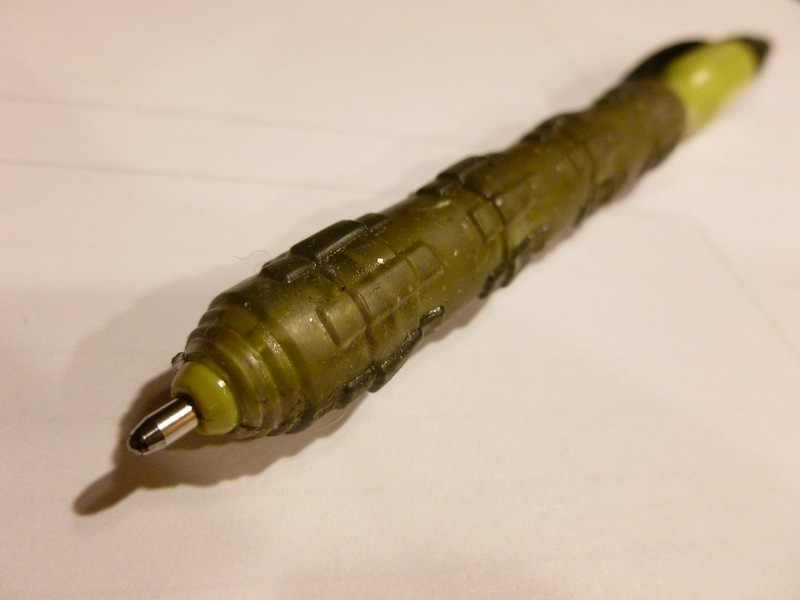 Folks with arthritis, carpal tunnel syndrome, and MS also sing the praises of the UGLee pen because its ergonmic design gives them a pain-free writing experience. You can read all of that on his site. I won’t bother rehashing the very thorough information here. 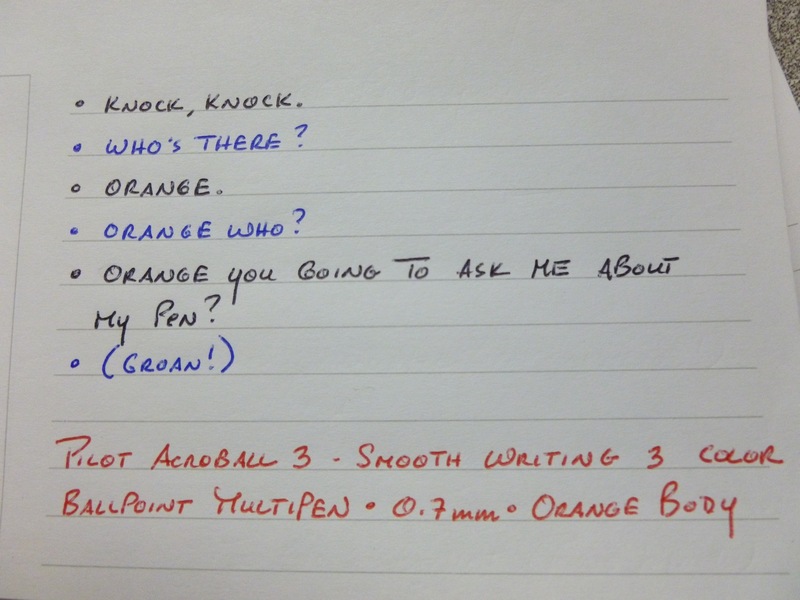 I will, though, discuss a few of the pen’s details. Detail #1: The Grip. Or should I say THE GRIP? Because that is one substantial grip. 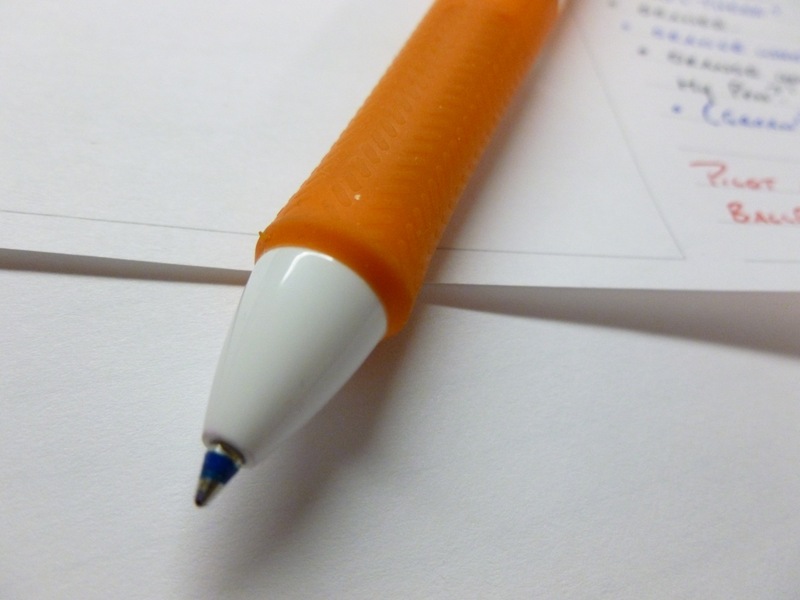 The pen measures a hair over five inches long, and the grip covers about 2/3rds of this length; from just under the end of the clip to just a spit above the the writing tip. 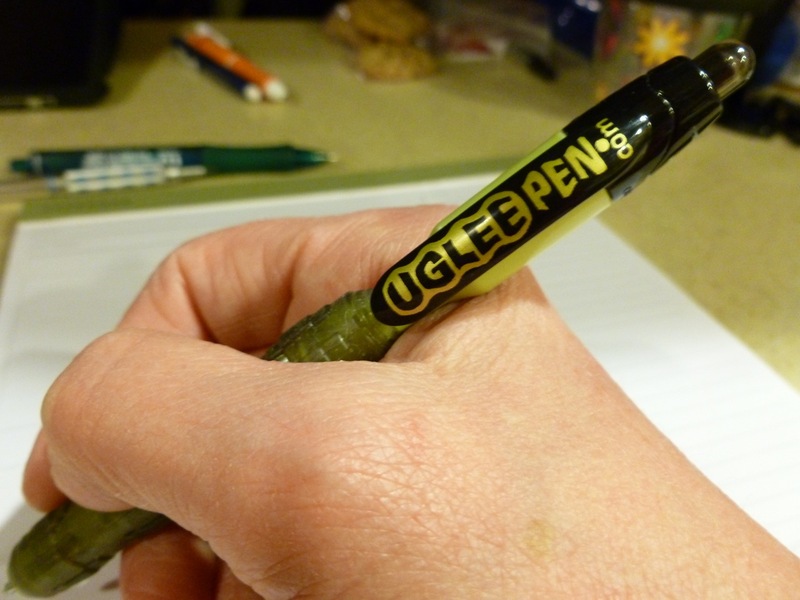 So no matter how you hold your pens…high, low, or somewhere in-between…your fingers will be holding the pen’s “ultimate” grip. Or more accurately, the grip will be holding onto your fingers. That’s what’s cool…the material grips your fingers, not the other way around. 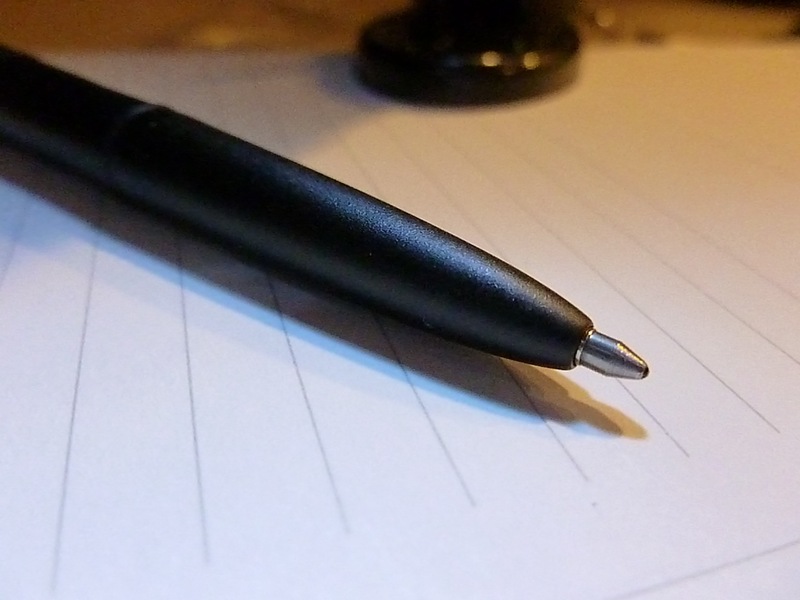 You can keep a loose hold on the pen and still write securely. No heavy gripping required equals less pain and no cramping. The grip’s ridges makes it possible for everyone…from small children to ham-handed adults…to experience the well-executed design of the scooshy (technical term) grip material. A little hard to describe, but hold one and you’ll see what I mean. 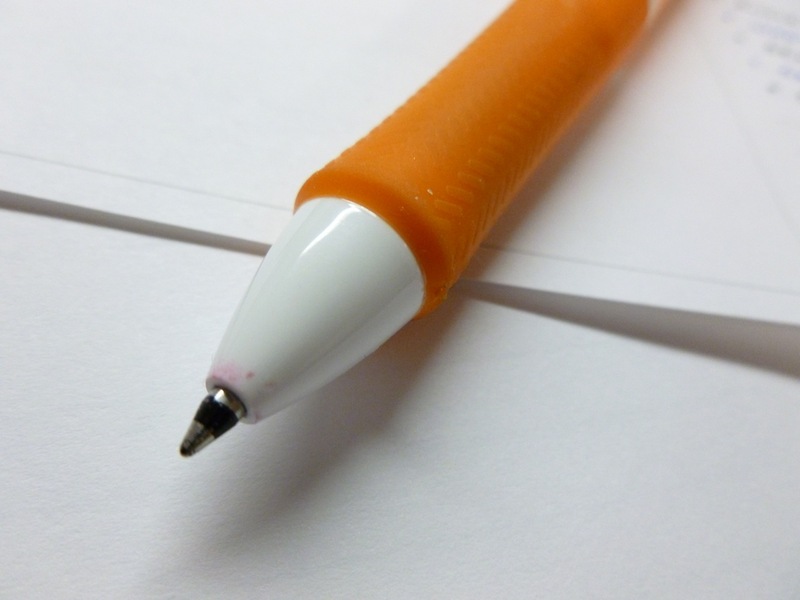 Because the pen is perfectly notched, it almost feels like it’s part of your hand, rather than resting on your hand. Yet another well-executed piece of the overall design. And if your hand is of a size that causes the notch to fall elsewhere, the indented areas of the grip will serve the same purpose (e.g., for small kidlet hands, the indents on the grip will give the same feel as the notch on the actual body). So the notch/grip notches are just the ticket for making this pen feel custom fit to your hand. 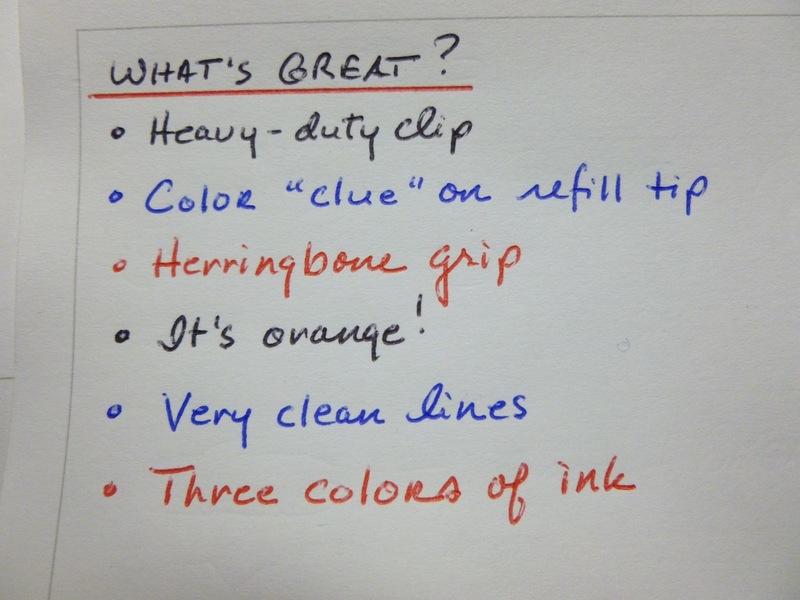 Dr. Lee describes the ink as “the smoothest ink system known- smoother than any rollerball, gel ink, or fountain pen.” Here’s where I have a few gripes. 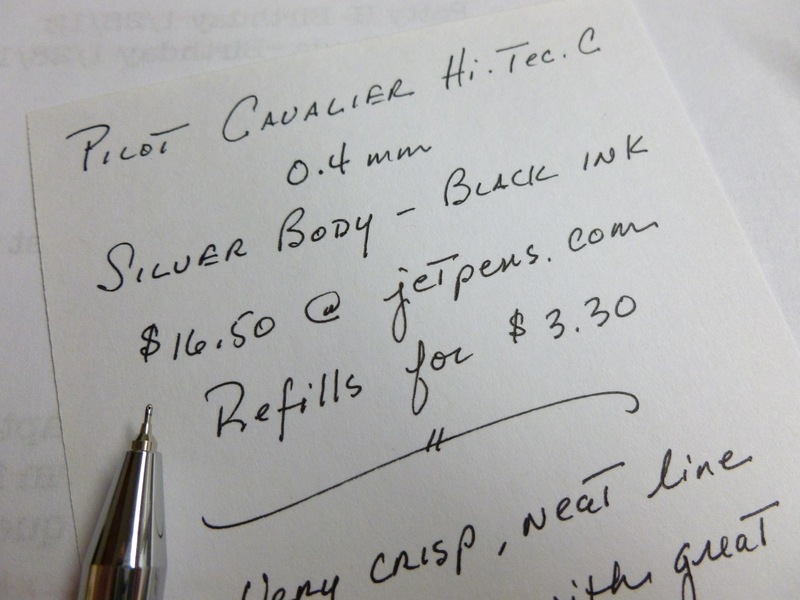 While the writing experience is smooth, it seems to me that that has more to do with the tip size (it’s big…maybe 1.4 mm) than the actual ink. The line is dark and bold, but there is some white space, and that always irks me. See? 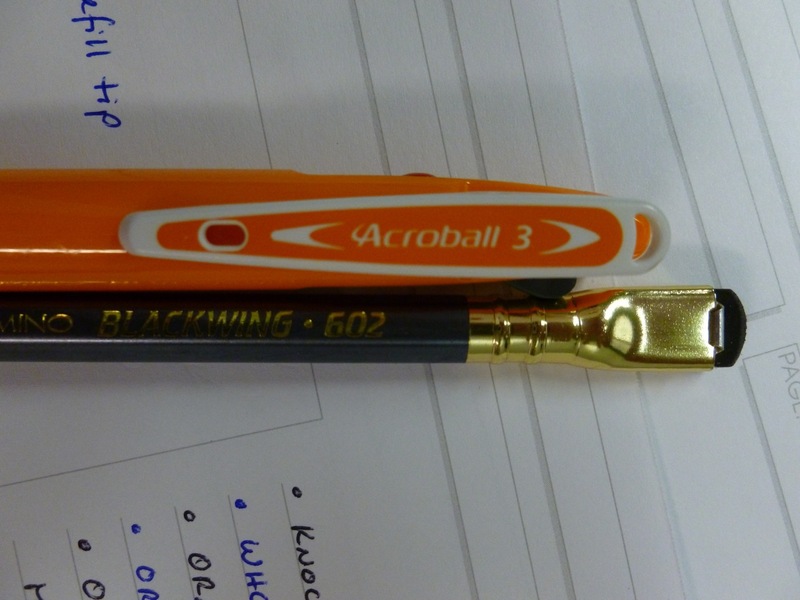 Despite all of the design features, the tip is just too fat and the ink too streaky (with an occasional blob) for me to consider this the perfect pen. It’s certainly not bad by any stretch, and if you’re suffering from writing pain, could be the answer to your pen prayers. 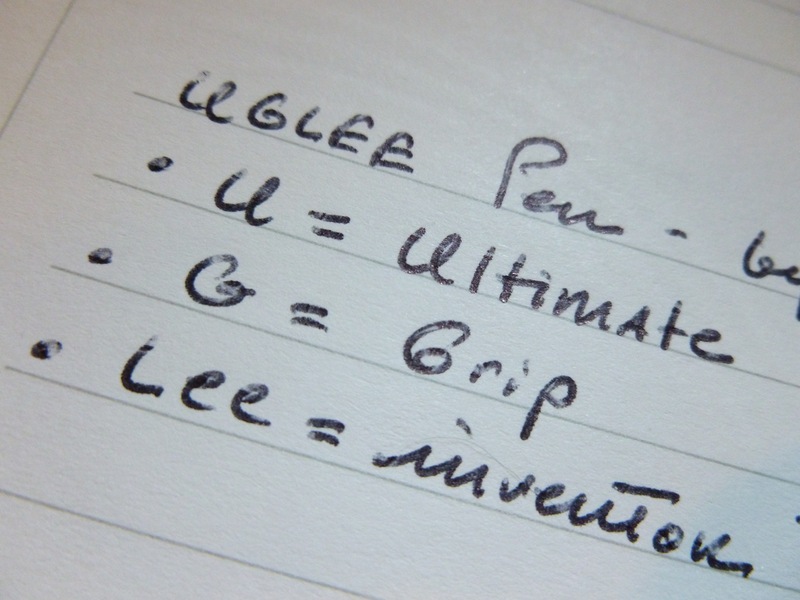 Oh how I wish the UGlee pen was offered in 0.5, 0.7, or even 1.0 mm sizes. Maybe the experience would be a little less smooth, but I’d happily give that up for a finer line. Right now, I feel like a surgeon working with a chain-saw rather than a micro-scalpel. 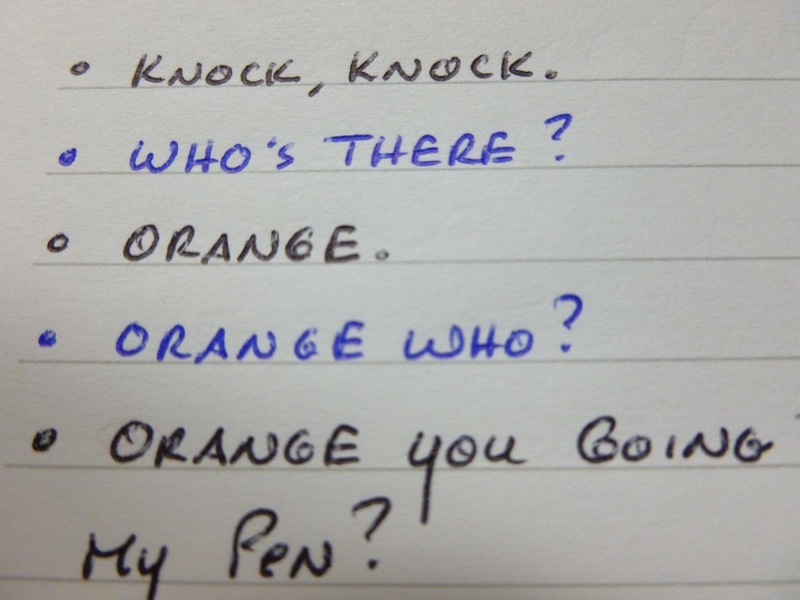 The ability to write with precision and finesse just isn’t there. But wait, don’t give up hope yet! 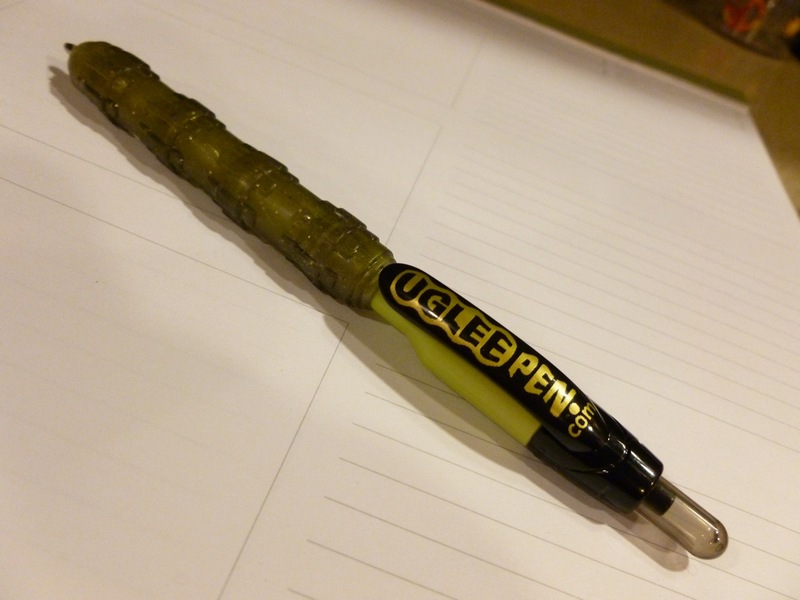 I have it on good authority that the refill in the Dong-A Anyball Ballpoint Pen fits the UGLee pen, so I’ve ordered a few in smaller tip sizes in hopes that I can hack this pen into perfection. Stay tuned for follow-up! So maybe the pen isn’t exactly beautiful, but it’s not ugly. It’s UGLee. And there is a difference. 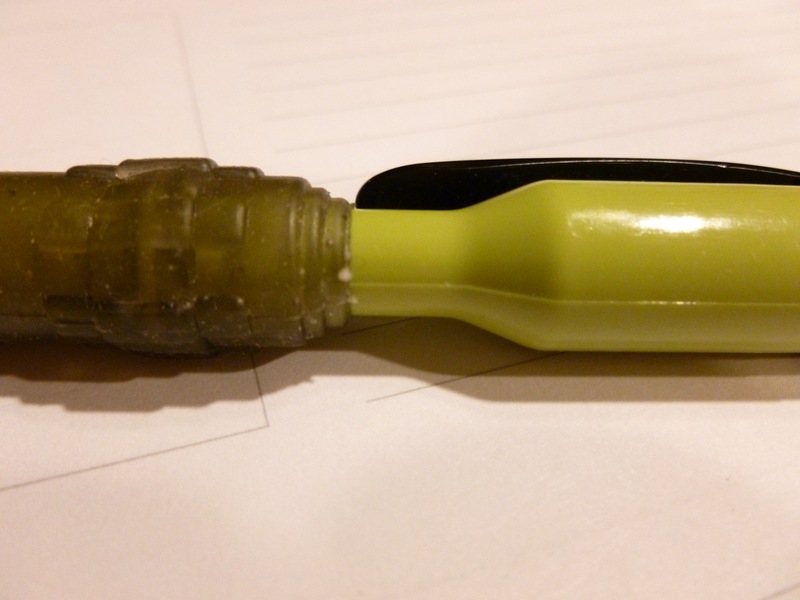 For the record, I love my Lamy fountain pens, of which I have a fistful. But this is not a love story. 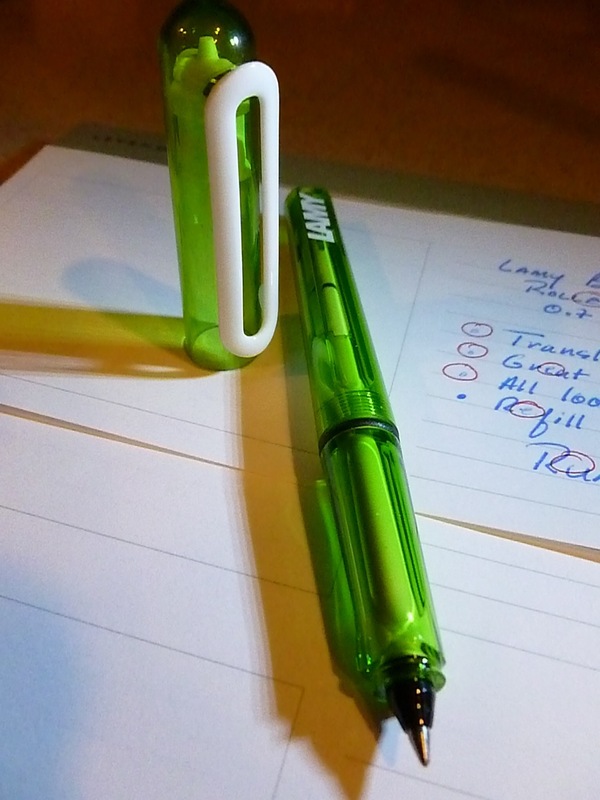 The Lamy Balloon Roller Ball’s translucent body and spot-on green color sucked me in. The white clip is cool. And it’s a Lamy. Lamy is a German pen company and I’m never disappointed by German stuff (German grandparents, German car, fabulous road trip in Germany in the 80’s, even sauerkraut). Until now. 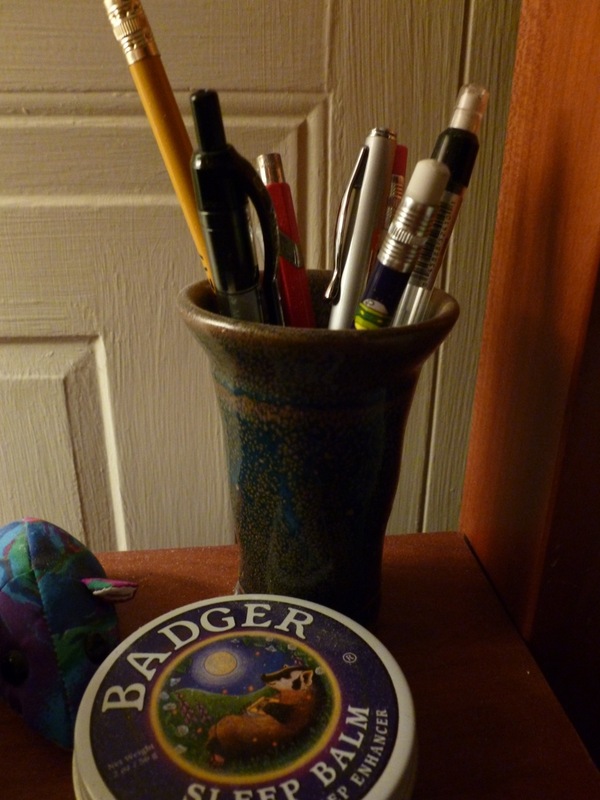 Every few months I get the pen out in hopes that it has miraculously cured itself. (Irrational, I know.) No such luck. 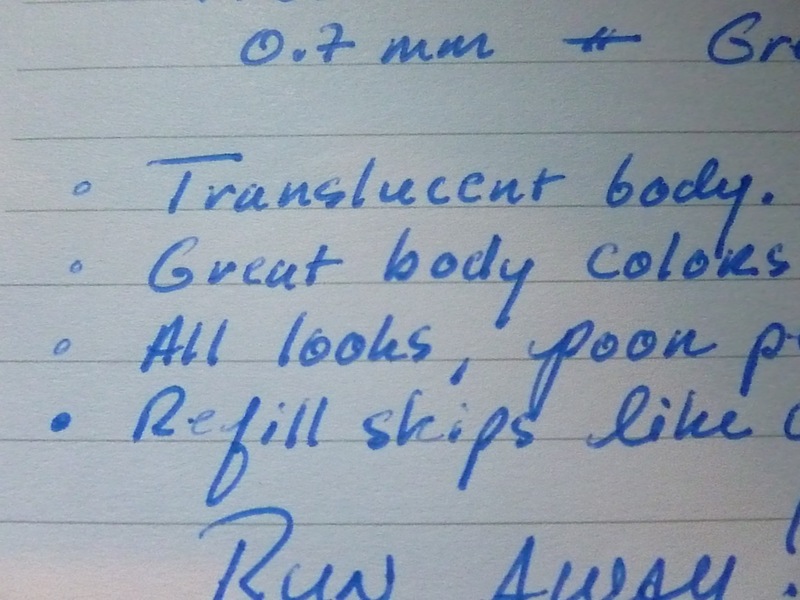 A quick check of the reviews on www.jetpens.com shows that I’m not the only one disappointed in the way this pen writes. 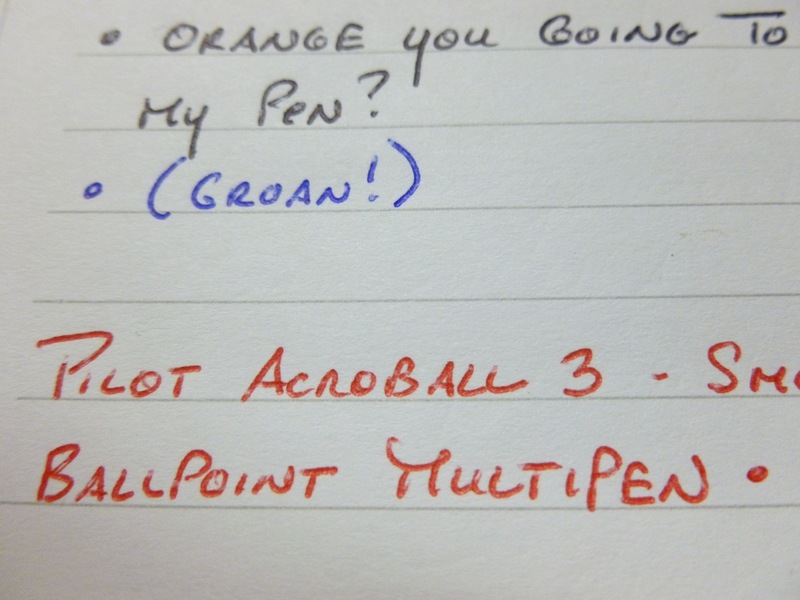 The overwhelming verdict is that the pen skips, and skips badly. Others have swapped out refills only to encounter the same problem, so it doesn’t appear to be an occasional issue. 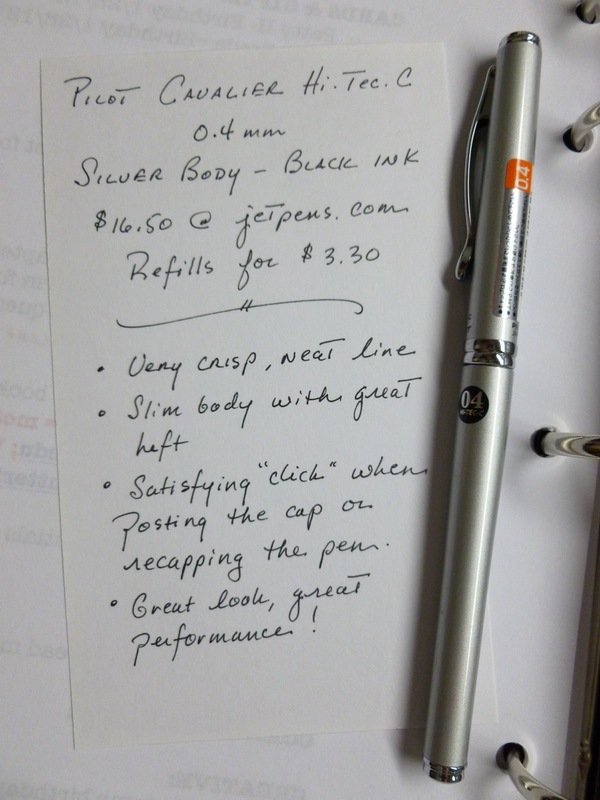 A while back I wrote to Lamy USA (with the pen!) 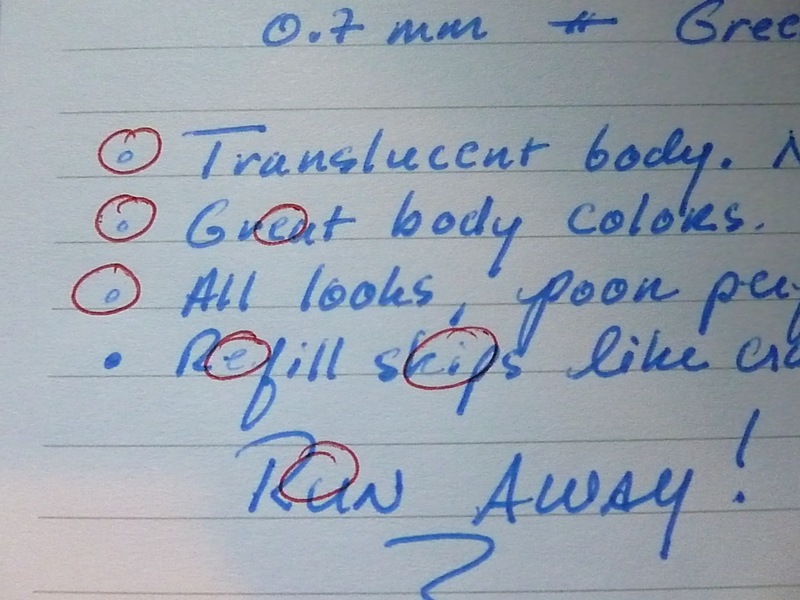 and pointed out how badly the pen writes. What I heard back was…..crickets. Not a peep. So, my advice? 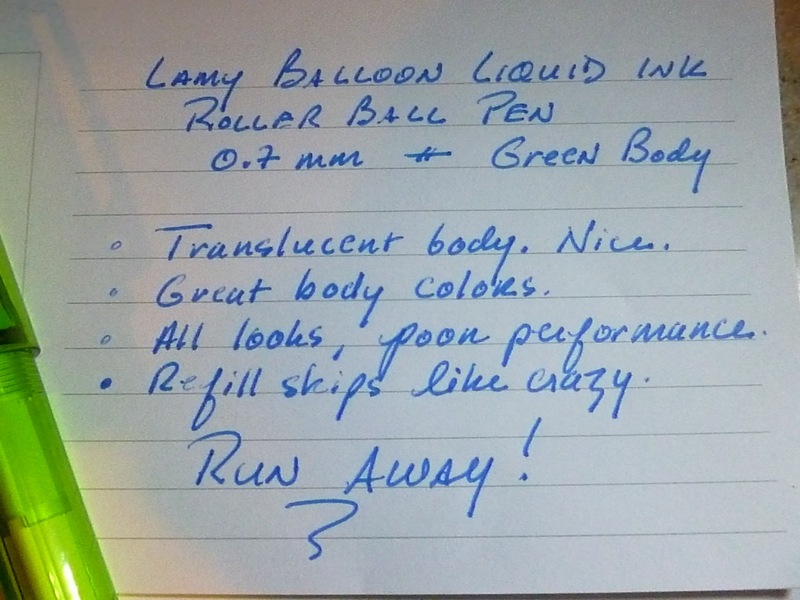 Run away from the Lamy Balloon. Run far, far away. 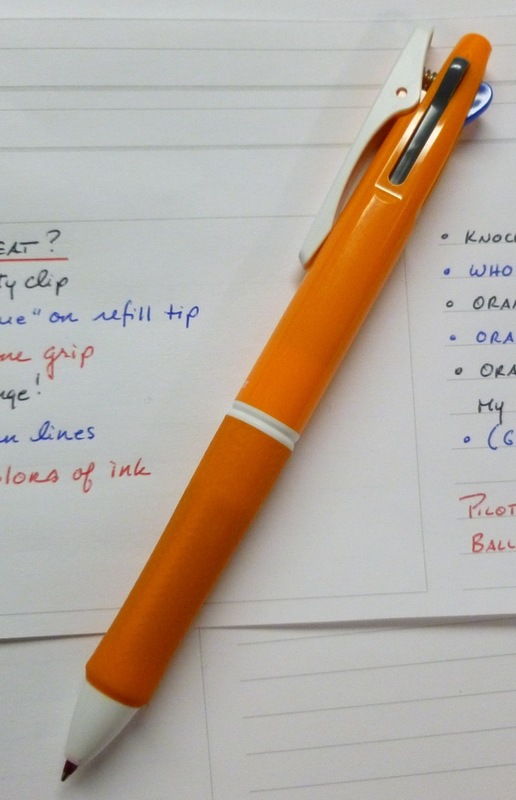 1) Anyone else suffering from Lamy Balloon frustration? 2) Are there any other refills that can be hacked into the body? I’d love to put it into action with a refill that does the body justice. 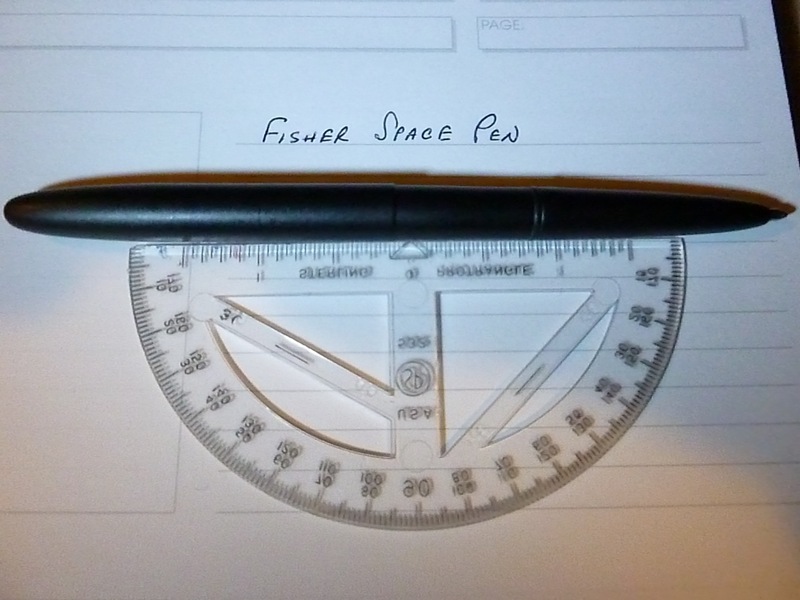 But then the Fisher Space Pen (FSP…much quicker to type) started cropping up in a bunch of respected and discerning pen review blogs (Hi, penaddict.com!). Since decades have passed since I wallowed in the tar, I plunked down a little birthday money and picked up the FSB (black matte bullet model). What a difference a handful of decades makes. 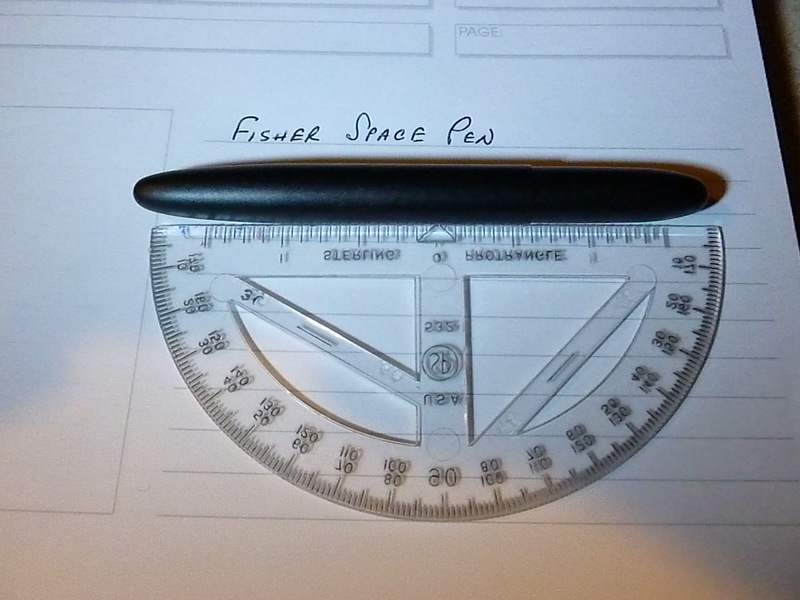 This FSP is a blast to use…very minimalist and compact. Because it’s clipless, it can roll off of a desk or counter, but I really like the stripped down look. I think a clip would get in the way, visually. 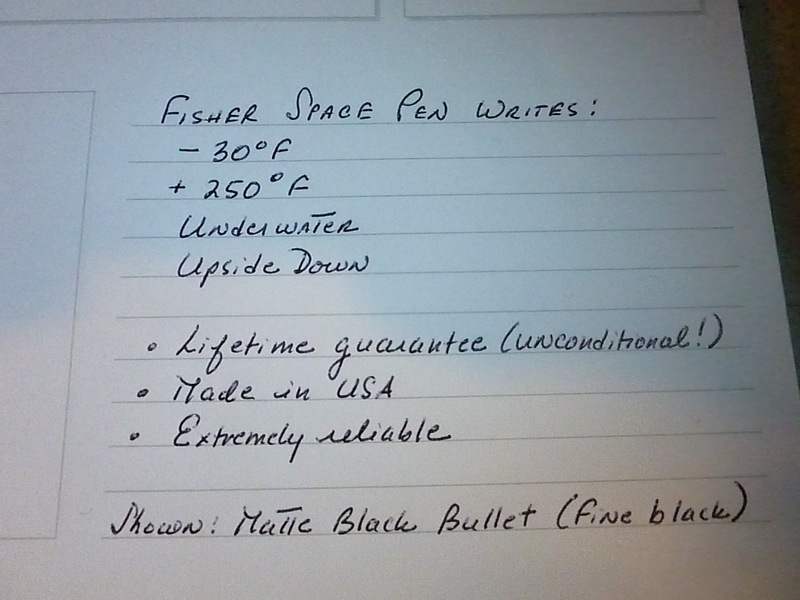 The pen came with a medium black refill which wrote fine (I mean, okay), but was a little broader than I like. After a few weeks, I swapped out that refill for a fine point and am happier with the writing experience (though fine feels like medium, which is probably why medium felt like broad.) I plan to stick with the fine refills from here on out. 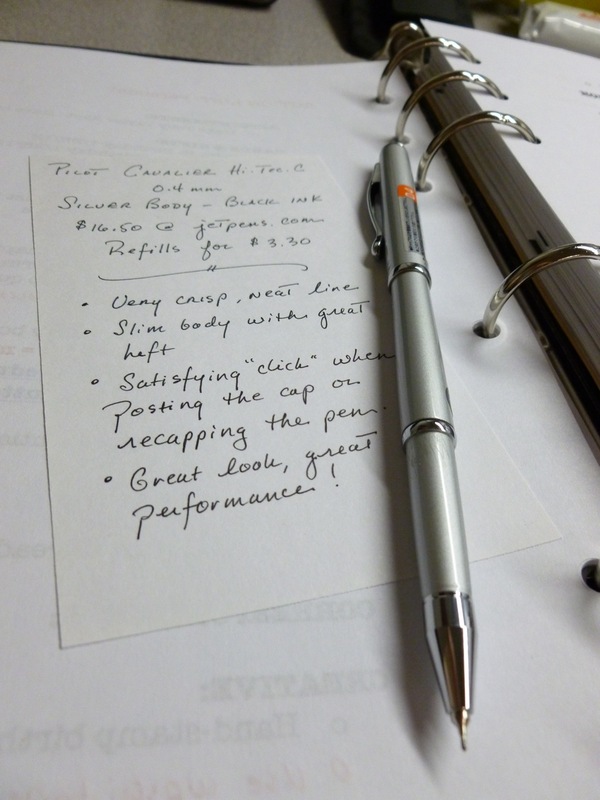 The pen feels sturdy and well-made, and even though I’ve been carrying it around in my pocket with change and keys and a pocket knife, the finish is still pristine. 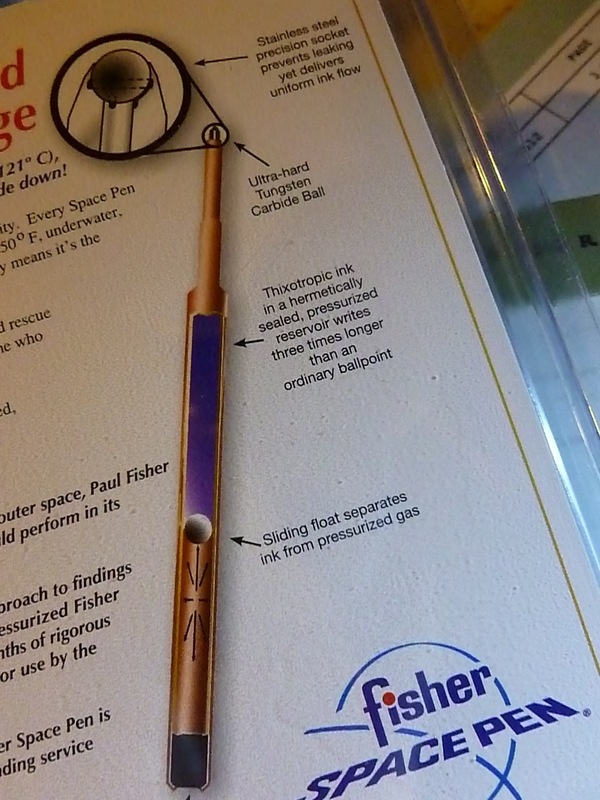 The back of the FSP package gives a brief history of the pen, as well as a view of its “guts.” This is where you can read about the gas plug and sliding float, the thixotropic ink, and the ultra-hard tungsten carbide ball, if you’re into such things. 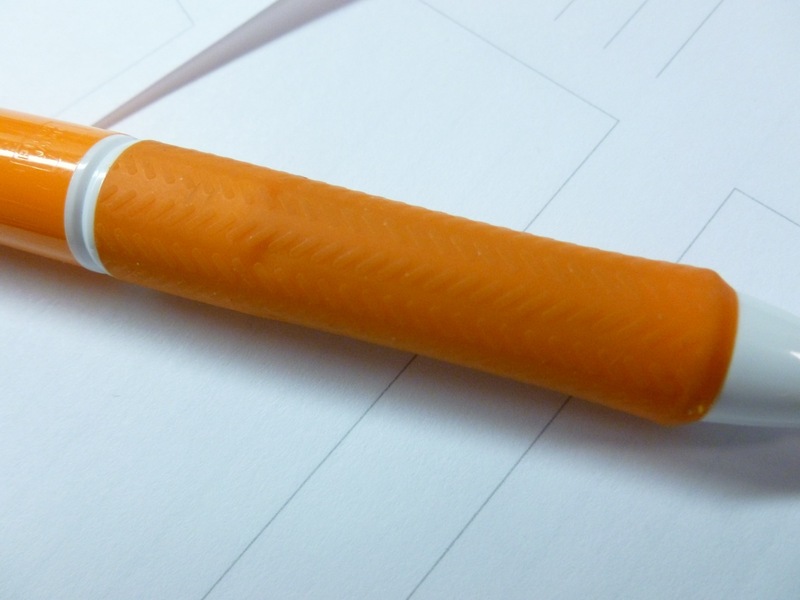 Countless experiments and a common sense approach to findings resulted in the invention of the sealed and pressurized Fisher Space Pen cartridge and in 1967, after 18 months of rigorous testing by NASA, the Space Pen was selected for use by the astronauts. The packaging goes on to say that if you’re not satisfied (Lifetime Guarantee! 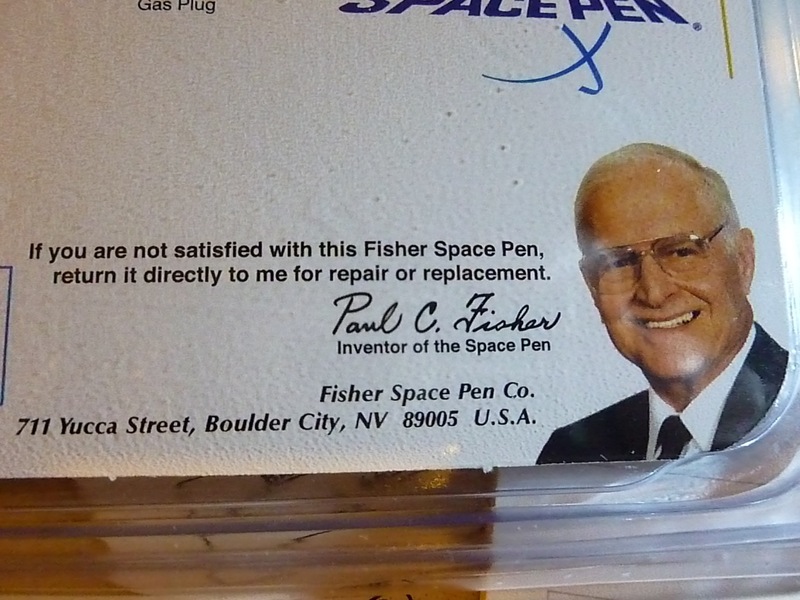 ), return the pen directly to Paul C. Fisher for repair or replacement. See? Turns out Paul C. Fisher passed away in 2006, so mailing it “directly” to him is a little tricky (what’s the zip?! ), but you get the drift. 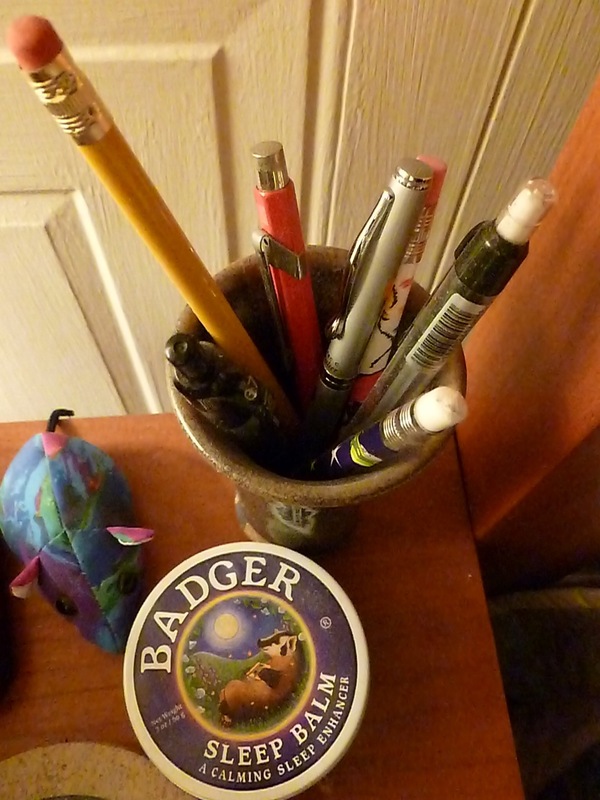 Now for the best part…the writing experience. 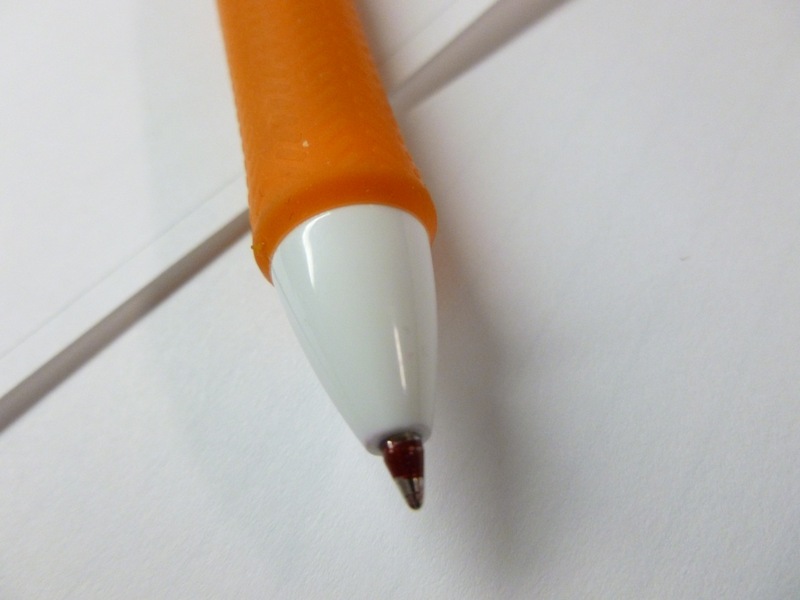 Gone are the thick blobs that so plagued my memory of this pen. The line is smoother and darker than I remember, and definitely cleaner. 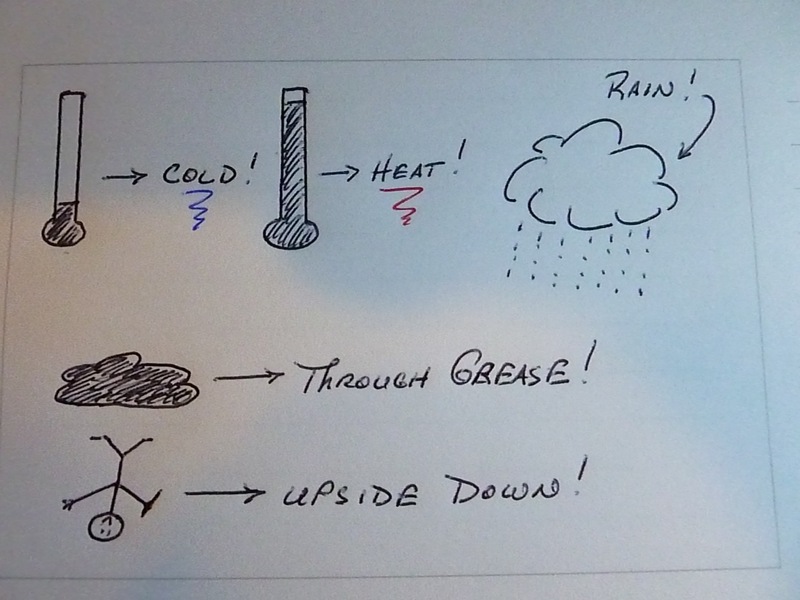 Not only is the writing experience on plain old paper very good, but the pen ALSO promises to write in all kinds of extreme conditions…from -30 to +250 degrees, through greasy, wet, or zero-gravity conditions, even upside-down. Writing letters on a trapeze, in the rain, while eating french fries, on a hot summer day? No problem. Reliable, is what it is. 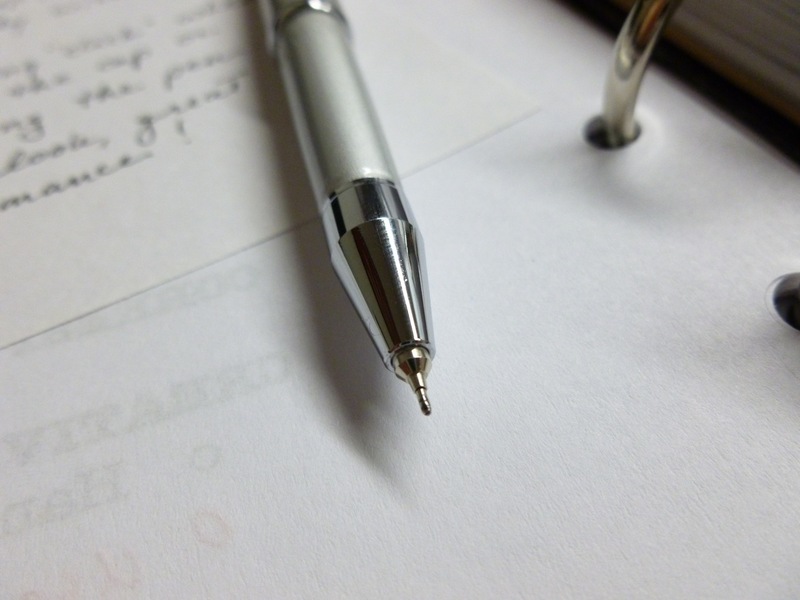 So while I may never be THAT hot or THAT cold or lacking gravity, I may find myself in a chilly car or writing at a weird angle and for those times, I have the go-to pen. Having a plain old luke-warm, full-gravity day? Well, it’s fine for that, too. Paul C. Fisher, I salute you, wherever you are.